The following appendices list services and sources of assistance and are meant to be neither conclusive nor to serve as an endorsement. This show held in October on odd-numbered years. Contact: George Little Management, Inc. The Boston Gift Show features New England specialty food products that can also be successfully merchandised via the gift trade. Attendees include retailers with strong pur­chasing power from a variety of gift, sta­tionery, and department stores, as well as representatives from mail-order catalogs, specialty stores, craft shops, college stores, museum shops, garden centers, and gourmet stores. The show is held in April and September. International Gift Basket, Floral and Balloon Jubilee! These are owned and sponsored by the Specialty Food Association (SFA), the largest association in the United States specializing in the repre­sentation and promotion of specialty food and confectionery products. It sponsors three very important annual food shows for its members, which attract buyers and deci­sion-makers from all segments of the spe­cialty food industry. 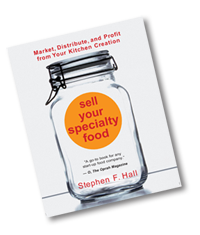 The association also sponsors food processor seminars devoted to food marketing and distribution issues. This show is held in Las Vegas, NV annually in October. Members can exhibit for $27.00 per square foot, non-members for $37.00 per square foot. This show will be held in the new USA Pavilion in New Delhi, India from December 2-4, 2009. India boasts the 4th largest economy and the 6th largest food market and is a key target for US exporters. The 11th annual International Halal Food Show was held in Brussels, Belgium in March 2010. The show is sponsored by the Islamic Food & Nutrition Council of America (IFANCA) and is dedicated to promote halal food and halal certification. Heavy emphasis on foodservice with over 900 exhibitors of food, freezers, utensils, uniforms, beverages, baked goods, etc. Sponsored by the New York State Restaurant Association and produced and managed by Reed Exhibitions. The Showcase is held each year at Chicago’s McCormick Place in conjunction with the Food Marketing Institute’s Supermarket Industry Exposition, and All Things Organic. It attracts supermarket industry executives from around the world. More than 52,000 retailers, manufacturers, functional ingredient suppliers and industry professionals attended the country’s largest natural, organic, and healthy products trade show, Natural Products Expo offers two annual Shows Expo East & Expo West. This is a trade only show held twice a year in January and August at the JacobJavitsCenter and surrounding venues with 2,700 exhibitors offering nine divisions featuring current and trendy home furnishings and specialty food gift items. Exhibit pricing depends on which category your product falls into or the physical location of your booth on the exhibit floor. Prices range from $34.75-$44.00 per square foot. The NGA is the national trade association exclusively representing the retail and wholesale grocers who comprise the inde­pendent sector of the food distribution industry. This trade show showcases fresh, frozen and refrigerated items, snacks, beverages and ethnic specialties sold under private label. It attracts major supermarket and drug chains as well as mass merchandisers. This show is held in October on even-numbered years. SIAL and ANUGA are bi-annual food shows which are particularly beneficial to European producers desiring to introduce products to the United States, and for U.S. producers wishing to export products to European markets. Average cost for a booth in the American Pavilion at SIAL, for example, is $13,495 (Euro 8541.00). Use the Web sites, above, for initial contact. USDA employs one of those won­derfully convoluted telephone answering sys­tems that generally requires making a long-distance call, listening to a listing of options, and then getting a voice messaging system. In addition to SIAL and ANUGA, noted above, there are numerous other interna­tional trade promotion events that may be of some value to food producers ready to explore international markets. SIAL China has been announced as an additional international trade show at the ShanghaiNewInternationalExpoCenter in the spring of 2009. There is also the SIAL Canada Show (formerly SIAL Montreal) serving the markets of North America annually at the Palais des Congres de Montreal Exhibition Center every April of every year. This show is sponsored by the Snack Food Association in Orlando, FL. Members pay between $7,800-$11,500 for a 10’X10’ booth depending on exhibit hall location and non-members may exhibit for an additional $1,250 fee. See contact information in Resource Listings under “Associations”. THRIVE is the only allergy and gluten-free expo in North America. “Be Informed, Live Better, THRIVE!” is their motto. This annual conference and exhibition is held in Minneapolis, MN every spring and attendance averages 8,000. The trade show is geared toward the coffee retailer and addresses issues of competition and profitability. Information and details can be found at the conference website coffeefest.com or by calling 425-295-3300 ext 123. Los Angeles Convention Center, is sponsored by the California Restaurant Association, Multi-Cultural Foodservice & Hospitality Alliance (MFHA) from Rhode Island and the Multiple Unit Operator Alliance (MUOA). The show is geared to restaurant professionals with focus on enhancing their businesses and learning the latest industry trends.